RACHEL GALLEY Rose Gold Overlay Sterling Silver Lattice Choker Necklace (Size 17), Silver wt 51.33 Gms. RACHEL GALLEY Rhodium Plated Sterling Silver Lattice Choker Necklace (Size 17), Silver wt. 49.00 Gms. Sitting beautifully at the base of your neck and tight to the throat, choker necklaces are the ultimate style statements of this century. In addition to a great fan following, chokers have an interesting history; from being worn during French revolution as a silent homage to the victims of the guillotine to more recent times where this style of necklace was a much-loved favourite by the Princess of Wales. It further spurred a craze in 90s with the plastic tattoo chokers worn as a symbol of rebellion, which none can forget. Choker necklaces are among the few jewellery items that have undergone a drastic change in style and setting through the history. Modern day choker necklaces are a combination of colours, patterns and materials going around the neck as heavy chains, delicate lace, chic strand of pearls and sophisticated diamonds. Necklaces cast in precious metals and embellished with gemstones are gaining popularity by the minute among the women in UK and the world over and that makes TJC the perfect choice with a legacy of unparalleled gemstone jewellery. 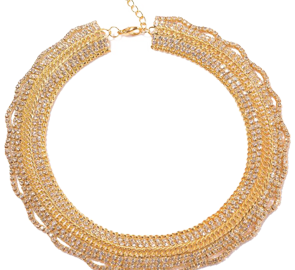 From big and bold to elegant and sophisticated, TJC has an impressive array of chokers. Adding an element of drama to all kinds of looks - everyday, professional, formal, and evening, these pieces are absolute stunners. We bring for our valued customers chokers with authentic Freshwater Pearls, Quartz, Austrian Crystal, Shells, Glass and Simulated Stones and Pearls accumulated from across the world. Our collection is also rich in thick gold plated brass choker necklaces that will take to your fancy in the first look; pair them with casual and formal outfits in solid colours for a magnetic look. Treat yourself with a versatile piece from TJC’s collection that will always complement your look no matter what the occasion. At TJC, we aim to help you discover the jewellery that define you the best, so channel your inner fashionista and indulge in the some exquisite choker necklaces from our collection.